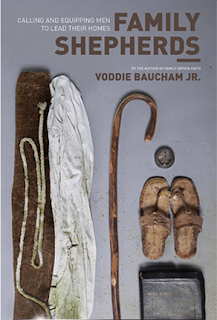 Family Shepherds by Voddie Baucham, Jr.
Christian husbands and fathers in this day and age have big shoes to fill, with the heavy responsibility of leading families in a world that presents no end of vices and distractions. To compound the challenge, it's not an easy job to learn by finding role models and watching them. One could figure out how to be a good football fan without much difficulty, simply by attending a game or two and observing behavior. But much of the character that make up a good "shepherd" of a Christian home is not put on display for all the world to see, and doesn't draw attention to itself. Marriage. Considering the primary attention given to marriage in scripture as a picture of the union of Christ and the church, this is a good place to start in applying the gospel. Baucham addresses God's purposes for marriage, explores how they should be lived out in our relationships, and identifies competing agendas (e.g. feminism) which can affect the clarity of our perception of what a biblically centered marriage looks like. Lifestyle – that is, our relationship to our vocation/business, church, government/politics, and our use of time. Much good advice to be found here for guys struggling to balance the various daily responsibilities demanding our attention. 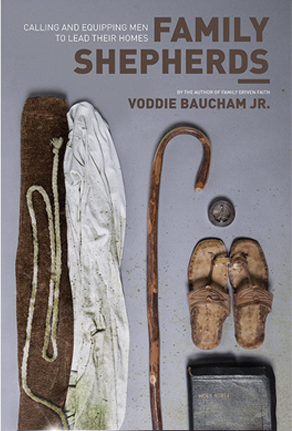 The book wraps up with some special notes regarding widowed, divorced, and broken homes, and offers some suggested tools and resources in the shepherding of families. Baucham's presentation is frustratingly clear and practical. "Frustating" because I would love to blame my own shortcomings on a lack of knowledge, resource, or clarity, and Baucham does not leave me that excuse. The learning process in which I, as a husband and father, am developing some ability to lead a family has been like embarking on a personal road trip... to Argentina. Thankfully, scripture exists as an infallible map, the Holy Spirit serves as a GPS, and books like this act as road signs. But, that means that when I drive merrily by a highway notice announcing, "Welcome to Alaska," there is no one to blame but myself. Praise God for the mercy he extends to us, as a patient Father who works through our lives to gradually shape us into the character of Christ. I'm grateful for how He has used the days and situations of our lives to gradually effect change, and for being able to grow by the instruction of others. In that, books like this fulfill a great purpose. And so, as my GPS would say, "Re-calculating..."
Crossway Books was kind enough to send a copy of Family Shepherds our direction in exchange for the sharing of an honest opinion. In this case, you get Jonathan's opinion - which is the better one to have in this particular situation. I would love to have this book in our home, for both of us to read. DH has read (more like studied, really) this one in the past few weeks. Are you familiar with Chip Ingram's ministry? He has a recent audio series on marriage that is excellent. Well, Jonathan, Carrie seems to rub off on the rest of us to create better reviews. I literally LOL at the idea of Carrie NOT recommending books to you. I will add this to our list of books that we'd like. Or that I'd like to share with my husband. I listened to a Baucham sermon a while back. I can't say it motivated me to read anything he's written. But this book does sound like he makes some good points. I wasn't surprised. Good review! Seems like a really helpful book for men. Well written review!! I can't wait to read this and I will pray my DH feels led to as well. Caniad--I must admit I like Bauchums writing style and "lectures" more than his sermons, so don't be put off! I recently read Family Driven Faith and saw him speak on the book and really enjoyed both! Also, there was virtually nothing about the role of the father as the homeschool headmaster. This is something that I see often neglected in Christian homeschool families, where Dad's just defer this duty to the mom alone, and that's just wrong. RN - Interesting. I'm personally glad that Baucham wouldn't go so far as to lay out an exact suggested plan for family worship. I think it wise of him NOT to because if he started doing that then he'd likely start garnering a following which you could liken to Bill Gothard or Vision Forum or any other groupie gathering or following that people tend to gravitate to so that they will not have to be discerning for themselves. I do agree with you though that dad's should play a role in the homeschooling of his family. But that, too, shall look different for each family. Great review. Sorta wish this book would have been around more like 20 years ago when we could have used it as a resource for our young family. But it sounds like it's a good one to pass on to grown children with families of their own. A must read!!! Fathers should not slack on their roles and will find reason in this book and examples in a more important book than than this...dont make me tell ya what that is!! !